The SHARPIE 36 was designed for a client who wanted a fast shallow draft sailboat with traditional sharpie lines. She has an easily driven hull and a sail plan of modest size. 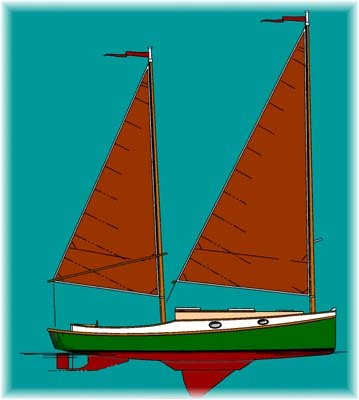 A shallow keel and weighted centerboard provide stability for this sharpie to stand on her feet in good wind conditions. Cruising speeds of 7 to 8 knots are possible with a top speed of 9 knots depending on wind. 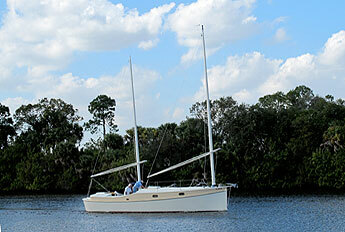 A single 40 hp outboard or a diesel sail drive will push her along making the miles go by on a small amount of fuel. She has twin rudders behind twin skegs. With this configuration she will sit upright if left to dry out on an ebb tide. Construction is plywood and epoxy over straight frames and bulkheads with a healthy amount of fiberglass and epoxy to seal her up. A steel version is available. She has accommodations for four. Other interior arrangements are possible including an aft cabin version with accommodations for six. Although designed for daysailing and weekending, the SHARPIE 36 has longer range capabilities for extended cruising in Coastal waterways, Florida Keys, Bahamas or your cruising in your favorite waters. Purchase and Download Study Plans for the SHARPIE 36 for $5.00 in PDF format (zipped file). Purchase Construction Plans for the SHARPIE 36 for $920.00 for delivery by US Postal Service.